Tendlite Review | Does this LED Pain Reliever Work? Info Tendlite Review - Does It Work? This TenDLite review is all about the popular US-made device that according to the many, many satisfied users really does work for them. I start here with a short description of it. 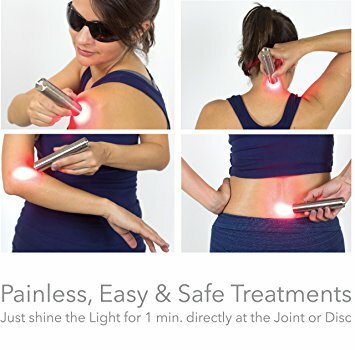 According to the TenDLite company, part of Lumina Inc., the light of their 660 nm wavelength red LED phototherapy device, penetrates injured body cells to stimulate the cellular energy to lowering inflammation, rebuilding tissue and getting you quick pain relief. The light is used on Pro Athletes by today's leading doctors, P.T. 's and trainers. Pains in knees, feet, back, hands, elbows, shoulders. And for inflammatory related ailments such as arthritis, tendonitis (tendinitis), buristis, carpal tunnel syndrome, plantar fasciitis, joint and muscle pain in general. - Use the device for your injured joint or other painful area. - The safe red LED light technology stimulates the area to produce the natural compounds to support the healing process. - The light also supports blood circulation there. - It also increases the cellular energy. - It stimulates collagen, a protein to repair tissue. - Brain releases endorphins and serotonin into the body. Treatment of Carpal Tunnel inflammation through this red light. What the light does is promoting the rejuvenation of the tendon tissue through stimulation of collagen production that then rebuilds and repairs the tendon tissue. Usually you treat an area for 1 minute, but if the area is quite painful you might use it for 2 minutes or a bit longer. The company states that their technology(which is not laser) is safe and that you will not hurt yourself when using it this way. - Just a short treatment needed, as their light is more intense than competitive products, says the company. - Easy to use design. LED light: Red 660 nanometers wavelength. Area coverage: 1" radius at 1 inch from optic. 1 large li-ion rechargeable Battery 18650 3.7V 3000mah. Voltage 4.5 Vdc at 1.0 watt input. The TenDlite comes with charger, protective goggles and case. There are some misconceptions about the term FDA-cleared. Many people think the FDA inspects and tests these kind of devices, but it does not. The manufacturer or distributor has to state in a notification form that the device is an equivalent of an already legally marketed device, so FDA can then determine - on paper - that the new device is substantially equivalent to the other device. That's it. Not every person with certain pains may get relief from using this device. People may reacts differently on certain treatments. Some people benefit more from medicines while others get relief from topicals. It's up to you to find out what benefits you best. Considering all the positive online reviews of so many people I think alot of people benefit from this popular device. See Tendlite Amazon here for best pricing of this great-rated joint pain relief therapy device. And you might read the reviews there. How about wearable devices such as the the Quell device? The advantage of these devices lies in its wearability. You can move around and are not limited to sit or lie down. It stimulates nerves and muscles to help you manage your chronic pain, such as back pain, fibromyalgia, arthritic pain and other pain related to sprains, strains. Here's more on the Quell device. Or go Here for red light emitting pain relief devices. And you'll find here more information about pain relief medicines, topicals, TENS units etc.